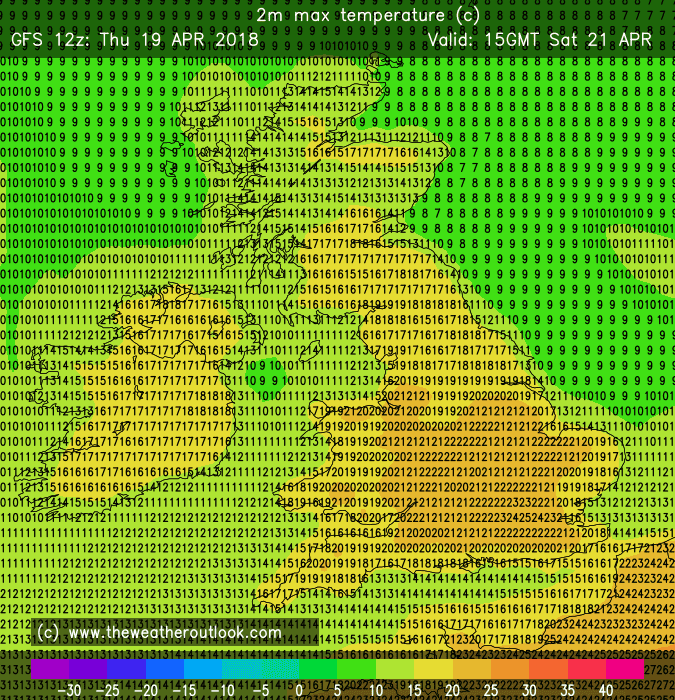 Official met office data now the hottest April day since 1949! Pathetic Gfs!! !...it has reached 29c 84f in London and it could rise a bit further yet!! I think today is going to outdo the models, still time to heat up given totally clear sky - that's in Oxfordshire anyway. Edited April 19, 2018 by Frosty. 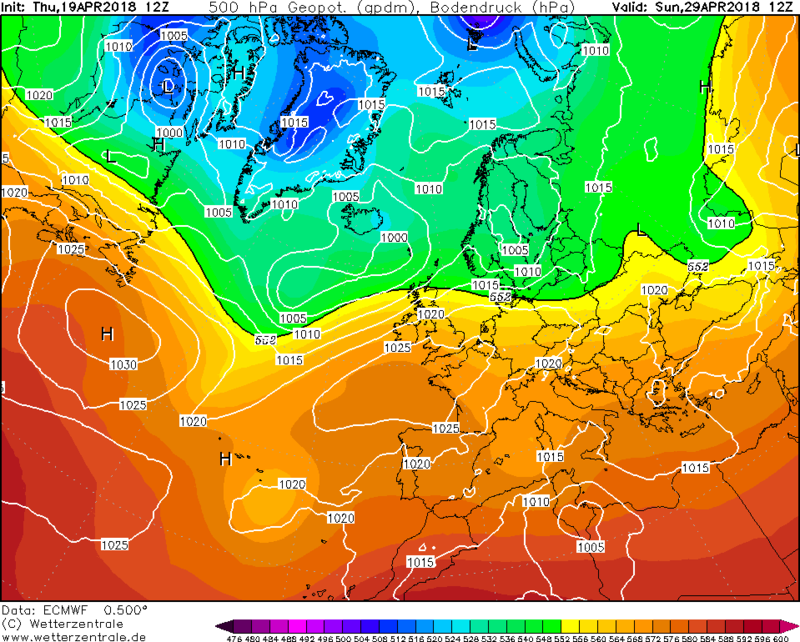 The Gfs 12z shows the very summery warmth continuing tomorrow further s / se and extending into the weekend, even on sunday across the southeast corner where temps could still reach 23c but there is an increasing risk of heavy showers / thunderstorms during the weekend although next monday looks largely fine and pleasantly warm across southern uk but significantly cooler than currently at 15 / 17c. Thereafter we are all into a more unsettled atlantic spell of low pressure (s) but on this run it doesn't last too long and ends with high pressure building in strongly. 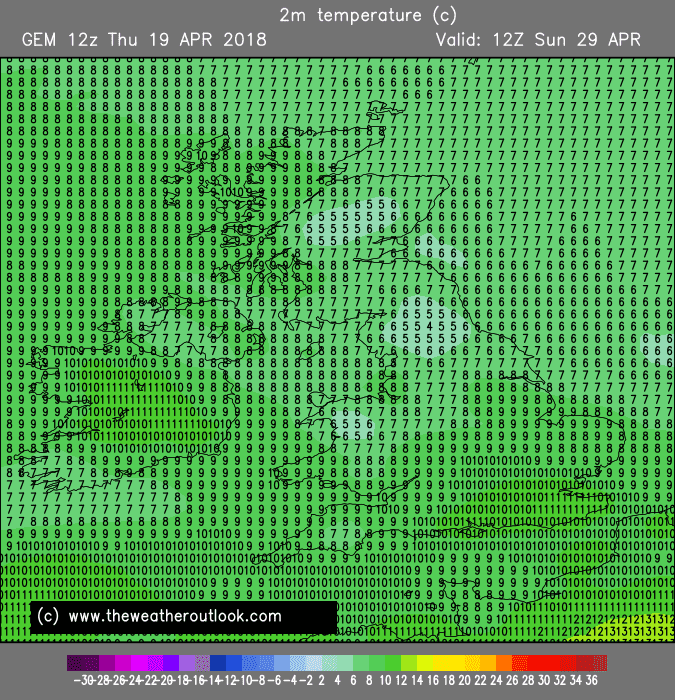 The Gem 12z shows an increasingly unsettled and much colder outlook during next week with some areas struggling to reach 5c at times..compare that to 29.1c today! Worth noting that the Arctic heights look to be lowering in general relative to the last couple of months, which improves our chances for seeing at least transitory ridges in between the lows next week onward. Actually though, the GEFS 12z mean doesn't indicate anything wintry, southern uk shows average temps (13-15c) a bit cooler for scotland. Exactly frosty....the mean just indicates average temps. 850s of 0-5c are easily double digits this time of year. You’d need sub -10 air now to get something cold and wintry....let’s leave it for 6 months and try again. You'd be hard pushed to call 12c "winter". 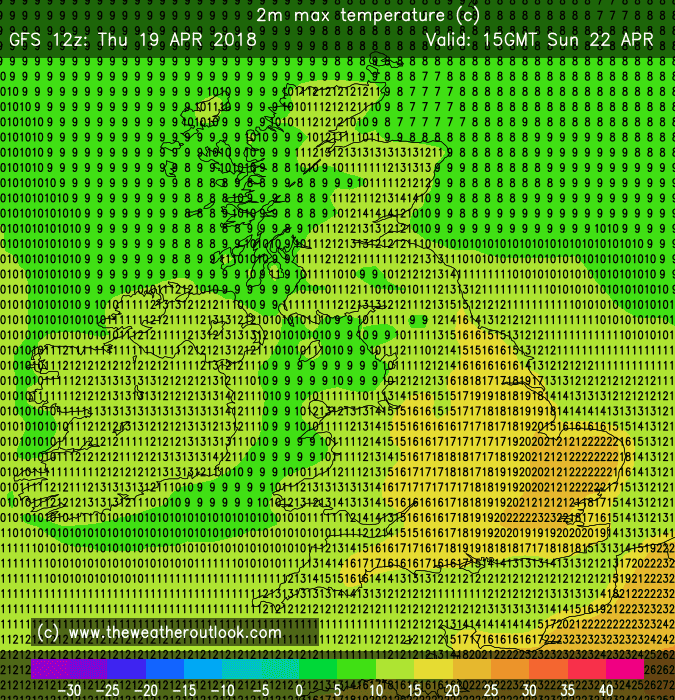 The Gfs 00z shows around 25 / 26c at 3pm for London this afternoon but the max won't be reached until around 4pm when it's expected to reach 27 or 28c so another scorcher for the SE, just a notch down on yesterday. 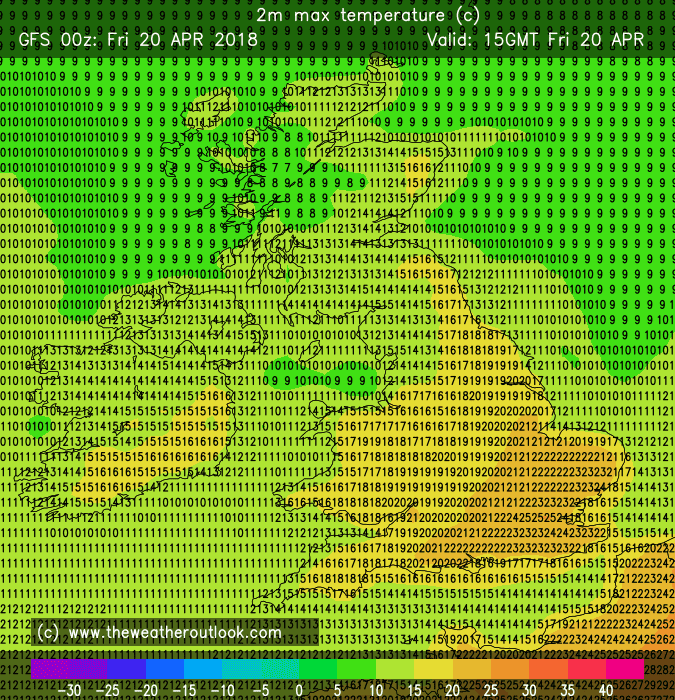 This weekend still very warm further south and especially southeast with temps into the low to mid 20's celsius but an increasing risk of heavy showers / thunderstorms. 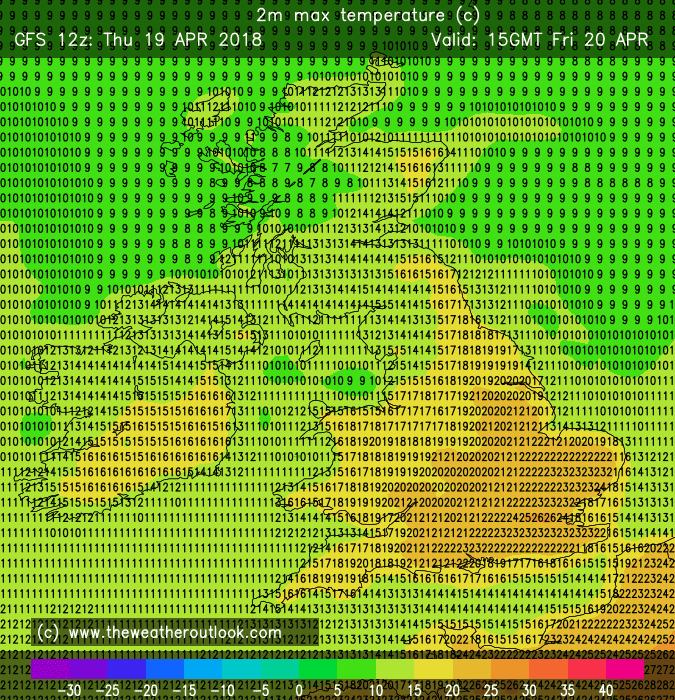 Looking at next week, temps returning closer to average but still feeling pleasant in the sunshine although there is some spells of rain indicated next week, especially further n / nw along with the coolest temps.  Edited April 20, 2018 by Frosty. First, kudos to those who called the heat correctly. I didn't think it would get past 25c in London let alone to near 29c and for all this we can think the SSW and the Beast from the East. 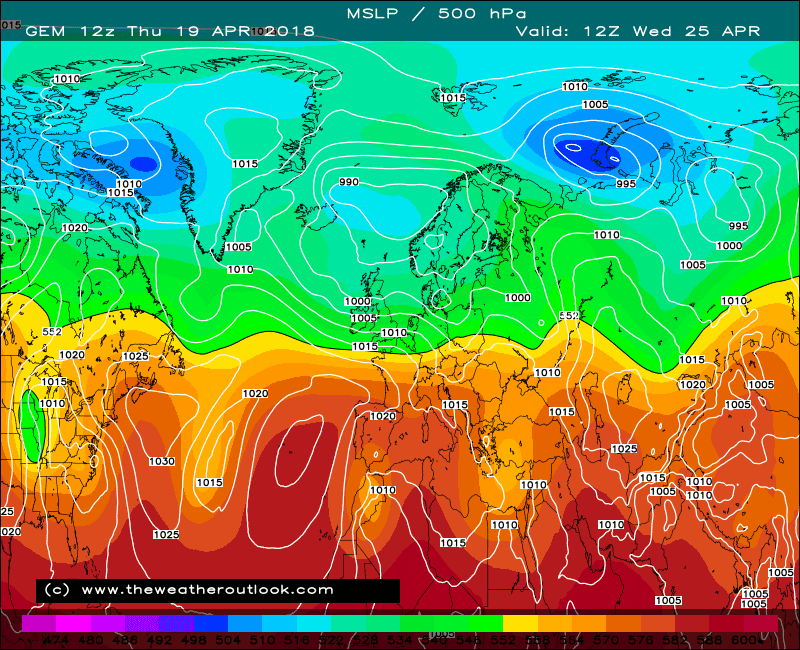 A moment - northern blocking and, more importantly, the trough to the south of the British Isles or over Europe meant warm air funnelled from Africa up over Eastern Europe so the Balkans got an early spring with 22c in Belgrade as early as March 12th. 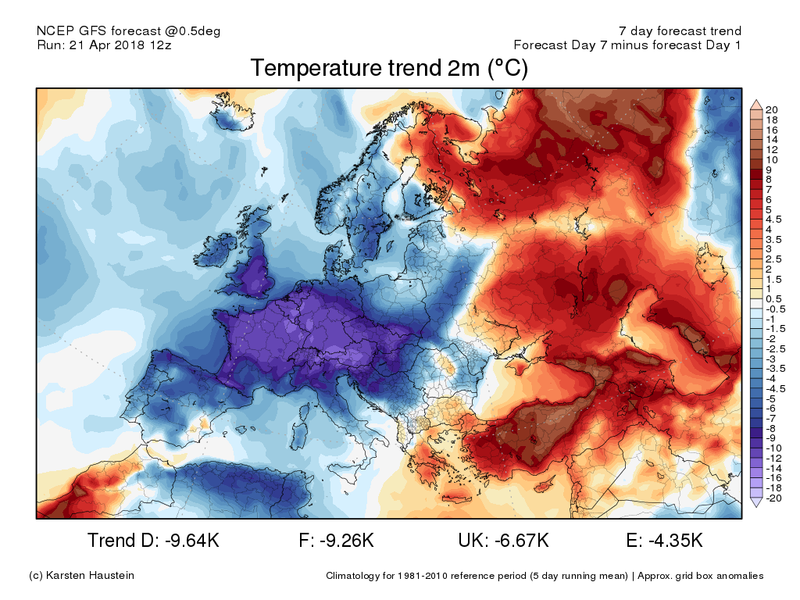 When the set up returned over Easter another warm plume moved up over south eastern and eastern Europe (24c in Belgrade on March 30th). 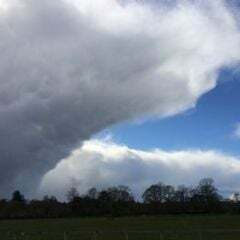 That meant when the synoptics enabled sir to be sourced from the SE said air was unusually warm and with the minimum fetch over the cool North Sea and aided by the strengthening sunshine, we got the record temperatures we have seen. Without the modification of the Atlantic, more continental-type climactic events are possible and in many of these the transition from winter to spring can, in temperature terms, be rapid. Look at what happens in North America and Siberia as winter eases - huge contrasts in temperature can be experienced even on a daily basis. Worth thinking about IF the Atlantic becomes less influential in our weather and climate. Back to a more normal pattern from next week with our weather coming off the Atlantic. 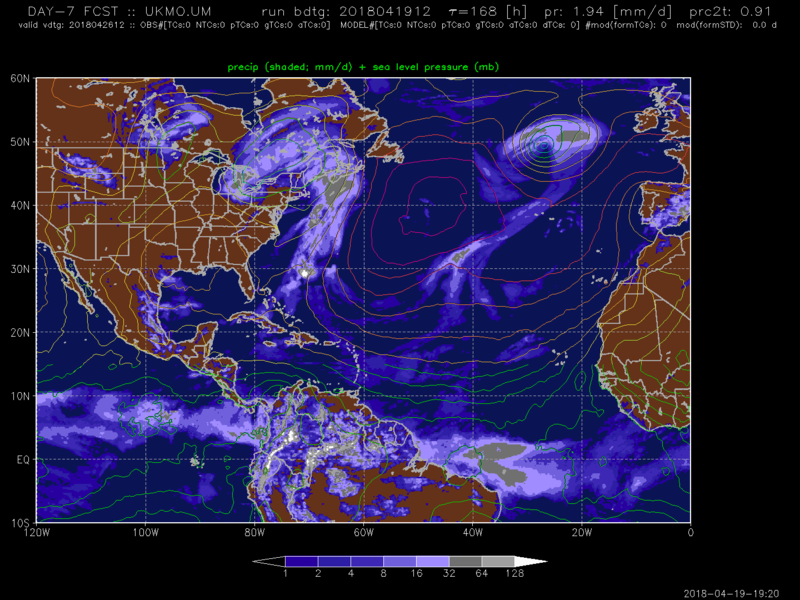 LP to the NW and HP to the SW and by T+240 a broad ridge from the (slightly displaced) Azores HP hints at decent conditions for most while LP is gathering to the west of Iceland and may become more influential as May starts. A more unsettled evolution. 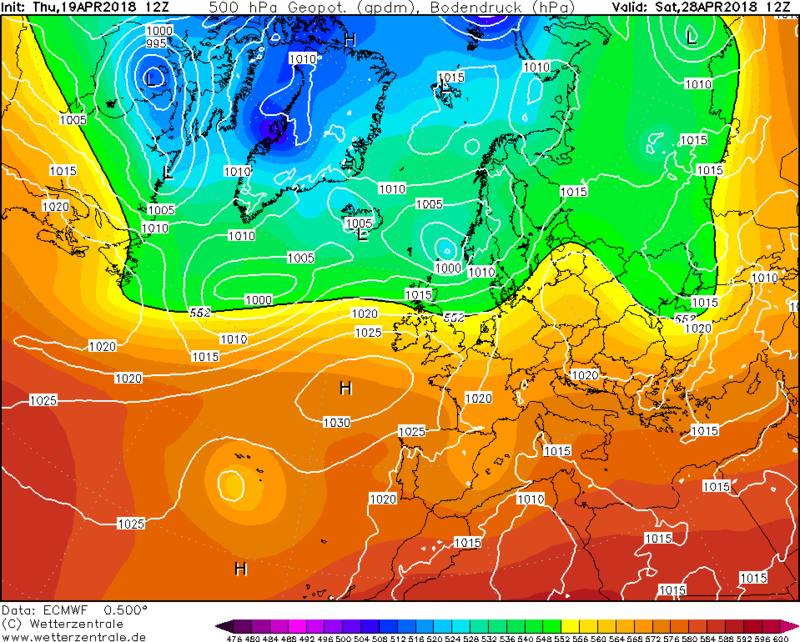 GEM re-orients the Azores HP more to the west and north and that allows the trough to drop SE over the British isles so we end up in a very unsettled pattern with slow-moving LP bringing plenty of rain or showers. Once again GFS teases with an E'ly but it wouldn't take much for the GEM evolution to reach a similar point or even the ECM evolution. 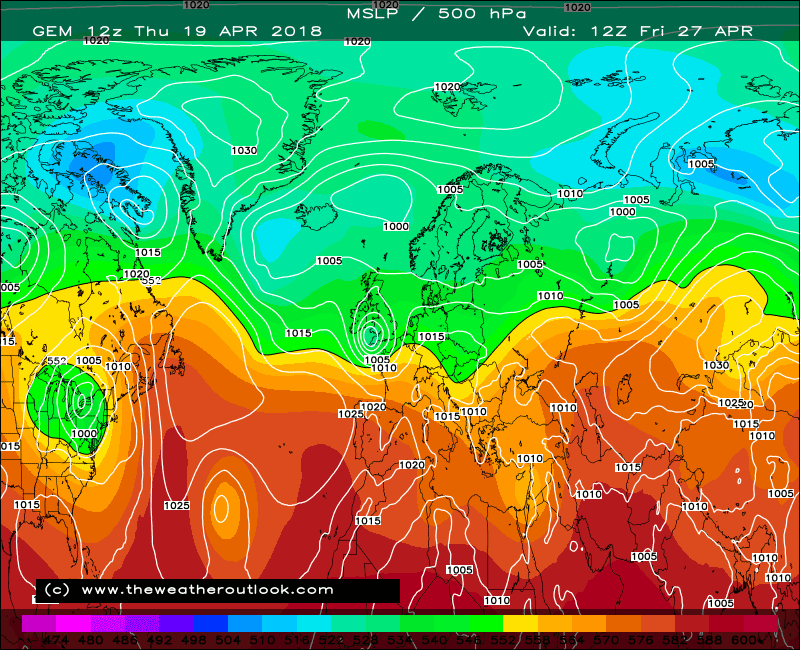 GFS has LP to the south west and heights build to the NW from the Azores using the "up and over" approach with the ridge inclining toward Scandinavia. 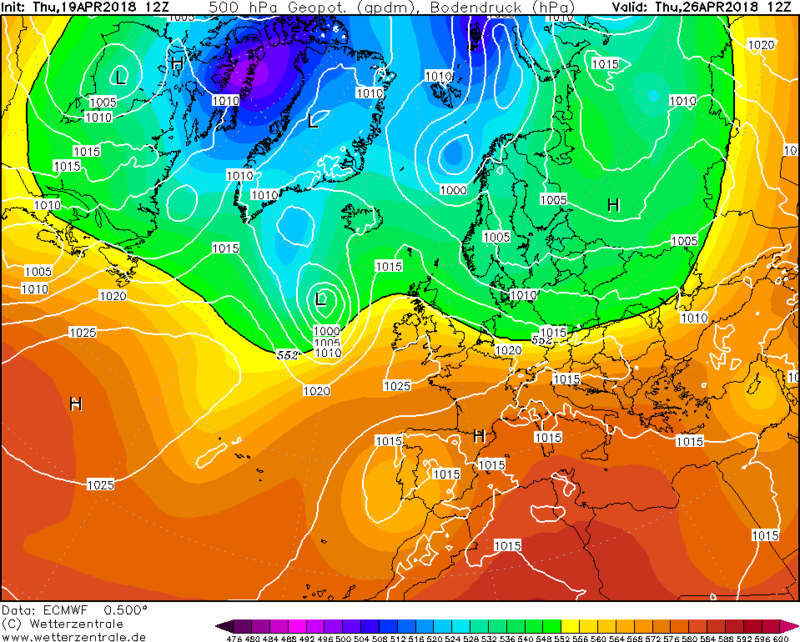 A warm pattern given the air source with showers or perhaps storms for the south but fine further north. 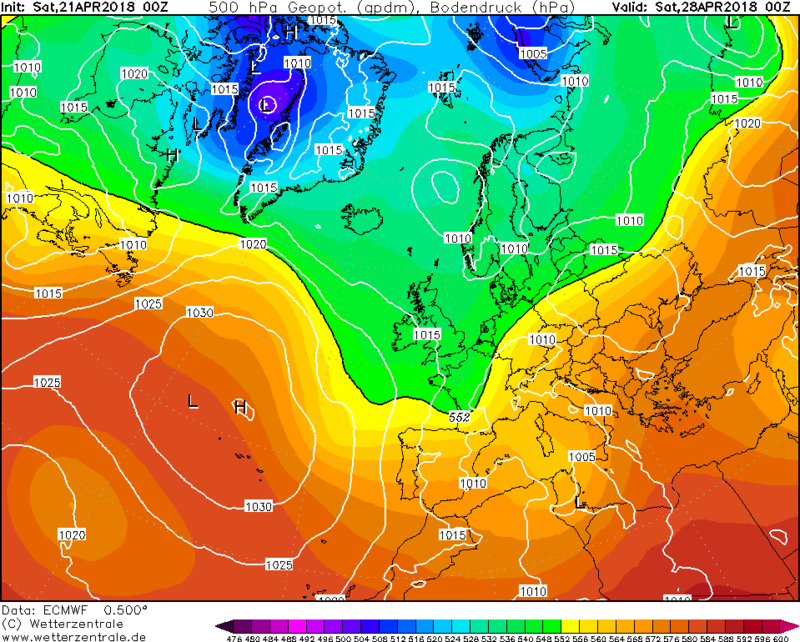 Further into FI the easterly pattern continues for southern and eastern parts but then shifts to a NE'ly and introduces a brief much colder air flow. A chilly northerly as the trough edges east and heights try to build in from the west. A more progressive version of the GEM evolution in my view. Further into FI, however, things turn much drier and warmer as a large HP builds over Scandinavia and ridges back SW across southern parts. A really mixed bag. Fans of heat can go straight to P10 which would rival if not surpass the current warm spell while fans of cold can go to P11 for their daily fix and while there doesn't appear to be a lot of spread the truth is for our tiny island slight changes in position and orientation of large weather systems can have huge impacts. The only trend I see is no trend. Mean puts LP close by and that's well supported and you can't go far wrong with that as a forecast but I'm struggling to see a clear message even at this range. In summary, the fine spell is a memory by Monday and next week looks to be more "normal" with a westerly pattern off the Atlantic. 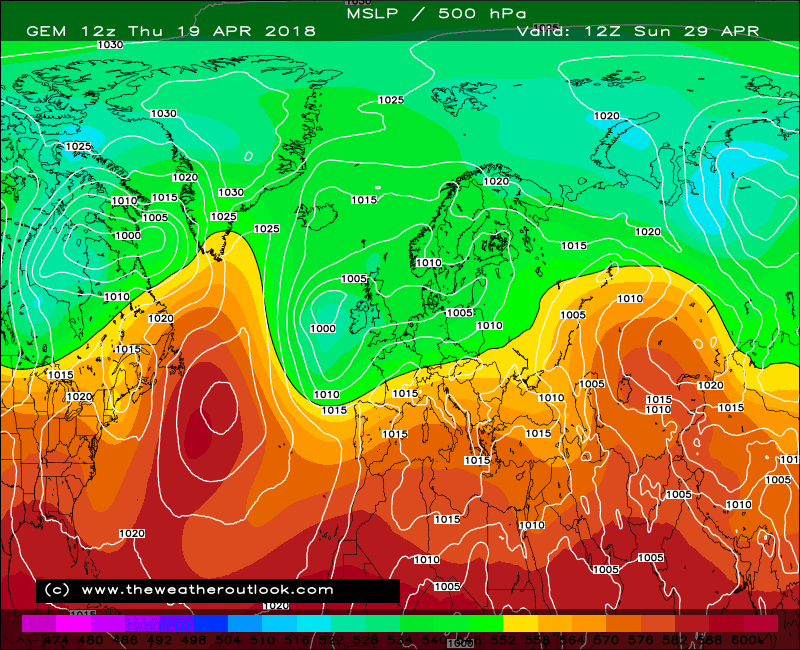 From there, the evolutions are varied - both GEM and GFS push LP close to the British Isles, the former has it over us and the latter to the south pulling in a prolonged spell of easterly winds. 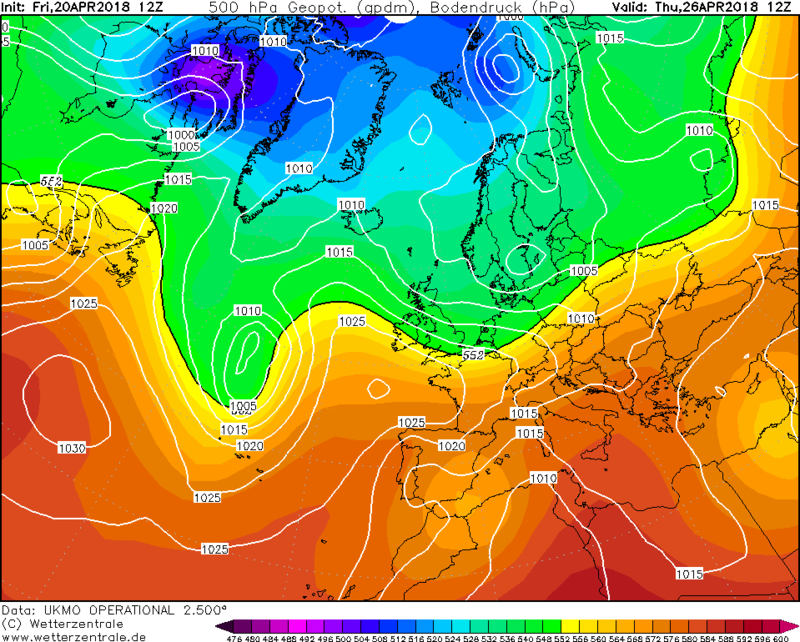 ECM keeps heights closer but you wonder if the trough at T+240 might not swing SE from its position west of Iceland. All hanging on that trough again....if it parks out west we could be back in business. If not, unsettled looks the order of the day. More runs needed! 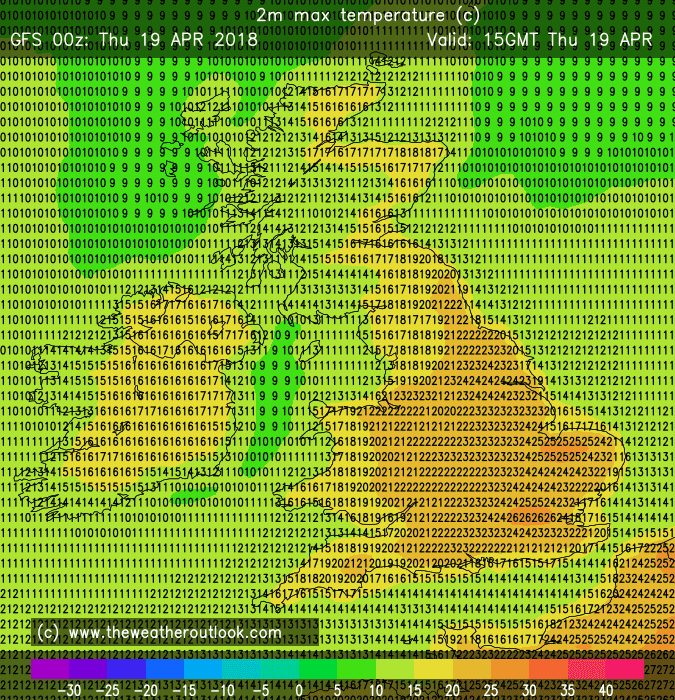 Interesting looks like the ECM is toying with some height rises at T192 as well Gavin hopefully we can get some more nice settled weather soon. Models aren't handling this small low too well....no idea how it will develop or where it will end up. All showing different outcomes! 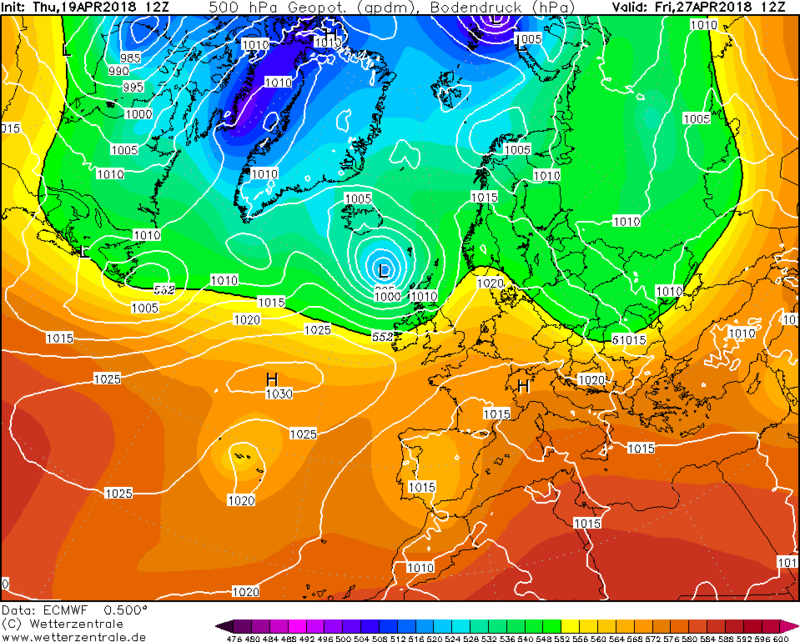 These show quite different weather, but a more amplified jet stream is in evidence across the models. 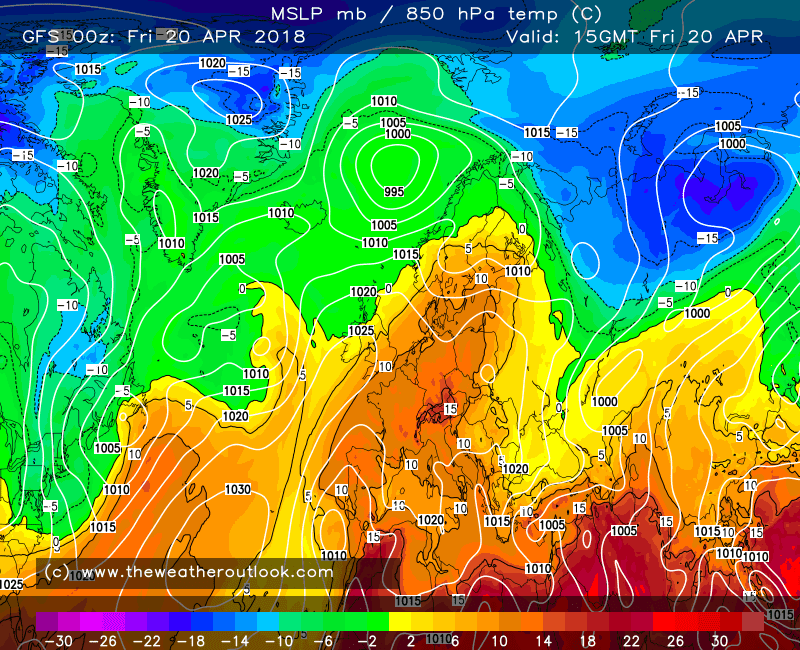 Increases the possibility in my opinion of the weather blowing hot and cold during late April and early May. Maybe something for everyone. Looking softly worse this morning as the pressure build doesn’t really happen, and we get stuck in the cooler air. Not too unsettled I. The grand scheme, but could be better! Indeed. A return to form, for the forseeable. Deck chairs and shorts, packed away! 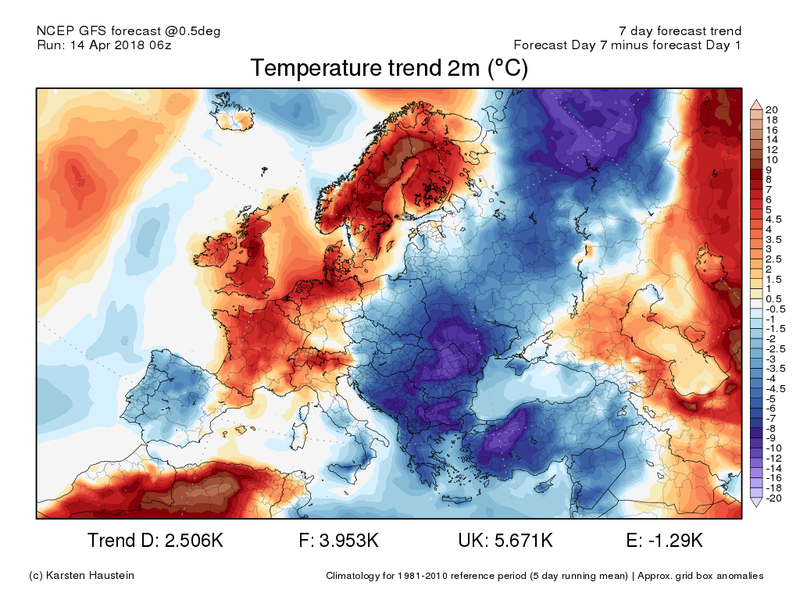 The EPS shows the temp anomaly turning negative as we progress; In addition, and interestingly, the EPS 46 dayer projecting a cooler than average May, UK-wide!